I read an article today about how the tombstone of a woman who died in 1872 was discovered in a yard in Lagrange, Indiana. Of course the obvious question was, if the headstone was in the yard, where were the woman’s remains? After some research the homeowners were assured the woman was actually buried in a cemetery about three miles away; however, the “evidence” didn’t sound reasonable to me. They still have no idea how the stone ended up in their yard, other than perhaps someone installed a new stone in the cemetery and buried the old stone in the yard. While this episode seemed to be a big deal in Lagrange (especially to the people who owned the yard), I don’t think it would have raised too many eyebrows where I live. I pass so many little family cemeteries that I seldom even notice them anymore, although one caused me to do a double take the other day when I saw it had been newly used. In most cases there is a large old house nearby that probably dates to well before the Civil War and it either is or was a part of a large farm. I imagine that generations of the same family lived in the old house and as they died they joined their ancestors in the family cemetery. 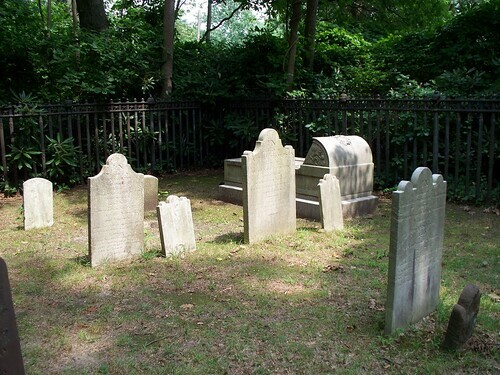 In most cases the cemeteries are very small, well-tended, and have a wrought iron fence around them. There are others where the house is long gone, and all that is left are a few tilted tombstones out in the middle of a field. I used to think that the family cemetery near the family home was a tradition limited to Virginia and perhaps parts of New England, but now I realize it’s a little more widespread than that. A quick search turned up the Rush family cemetery in Pennsylvania, the Duvall family cemetery in Kentucky, and the Ellicott family cemetery in Maryland. I’m sure there are thousands more, but I still don’t know if it was as common west of the Mississippi as it is here. I guess in most cases the family thought their old house and farm would remain in the family for many generations to come; in some cases that happened, but I suppose in more cases it didn’t. Without getting into religious beliefs, it’s interesting to contemplate that in some instances the old house has continued on as a sort of memorial to the family’s history and the headstones are tilted or gone, but in other instances the home itself is gone and all that remains of the family’s history are a few nearly-illegible headstones.